Dhruv Jain always seemed to have skin infections, and he got sick easily. Doctors in his native India originally believed his skin infections were a type of allergy. But medication wasn’t helping. Bloodwork eventually showed Dhruv had been born with a compromised immune system. To find out what was causing his immunodeficiency, Dhruv’s family brought their son to the United States. But tests came back inconclusive until doctors referred Dhruv to the National Institutues of Health for genetic testing. One year after beginning genetic testing at the NIH Clinical Center, Dhruv’s family finally got a diagnosis: Dock8 deficiency, a rare genetic mutation on the Dock8 gene that causes immunodeficiencies, leaving patients prone to minor and potentially aerious viral and other infections, along with certain cancers. His diagnosis made Dhruv eligible to participate in a Dock8 clinical trial through the National Cancer Institute, where advancements in bone marrow transplants have helped children and adults with a range of immunodeficiencies replace their compromised immune systems with healthy ones from donors. In 2015, Dhruv underwent a successful transplant that helped him rebuild a healthy immune system with the help of a donor from London, England. But none of this would have been possible without your support of The Children’s Inn. 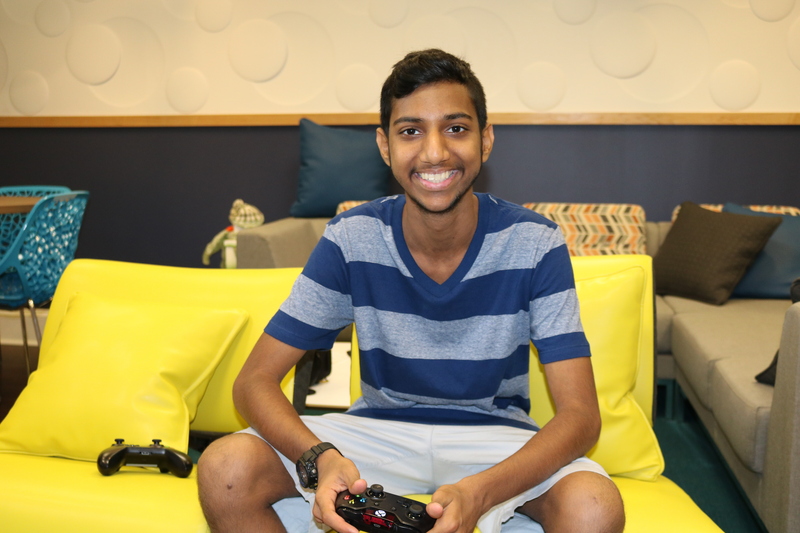 Since 2014, Dhruv, 16, has stayed at The Children’s Inn 17 times – all at no cost to his family. Thanks to The Inn, Dhruv has had the chance to engage in his favorite activities even while being treated at the NIH Clinical Center for days, weeks or months at a time. It’s no wonder his favorite places at The Inn are the outdoor sports court and the game room, where he has made friends who share his interests in sports and video games. Today, Dhruv has a healthy immune system, and he’s focused on his future and education, and he visits The Inn and NIH for check ups. The rising 10th grader is working on an international baccalaureate in Kampala, Uganda, where his family now lives. After graduating, he hopes to return to the United States as a college student, not a patient.